Rocky Beach Chris Hein collects images for photogrammetric analysis of sediment organization on a Prince William Sound beach. © D. Janka (M/V Auklet). Egypt A wave-cut notch, evidence of a sea-level highstand ~4,000 years ago, at the mouth of Wadi Gawasis along the Red Sea in Egypt. This site is home to the world's oldest archaeological evidence of long-distance seafaring and was occupied during the Middle Kingdom of Ancient Egypt. © Chris Hein/VIMS. Direct-Push Drill Rig Chris Hein used this geoprobe direct-push machine to core the paleo-inlet sequence on Plum Island, MA. It might seem like common sense that a 1-foot rise in sea level, as predicted for the mid-Atlantic by 2040, would flood everything less than 1 foot above current sea level and leave everything above that point high and dry. 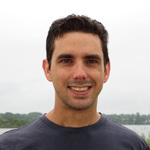 Research by Assistant Professor Chris Hein, one of several new faculty members at the Virginia Institute of Marine Science, shows that the actual inundation process is likely to be far more complex, with shoreline contours themselves changing in response to natural and human-driven changes in sediment supply, coastal storms, and other factors. Hein began as an assistant professor at VIMS in July, following a two-year postdoctoral research fellowship at the Woods Hole Oceanographic Institution in Massachusetts. He earned his Ph.D. in 2012 at Boston University, where he used fieldwork in Egypt, Brazil, and New England to study the evolution of coastlines as sea level rose following the last Ice Age. His B.S. degree, in geological sciences, is from Cornell University. Hein first became interested in geology during family trips to America’s western national parks, and focused that interest during visits to the shoreline of his native Long Island. Hein notes that coastal zones will respond to three interconnected processes as climate warms: changes in sea level, changes in the intensity and frequency of storms, and shifts in sediment supply. He’s particularly interested in the latter, with research to determine how natural changes in past climate have affected the erosion of sediment and its transport to the coast by rivers; how humans have modified sediment supplies through dam building, dredging, and the construction of jetties and seawalls; and how these processes are likely to change with global warming and sea-level rise. 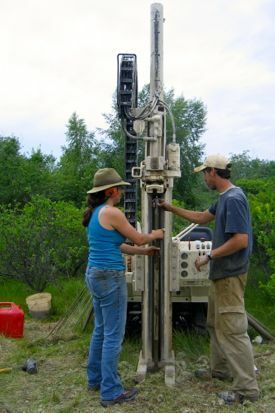 The first grant will allow Hein and collaborators to study long-term changes in the amount and types of sediment and carbon carried by the Ganges and Brahmaputra rivers, and to use these data to track shifts in the Indian monsoon and changes in vegetation cover in the Indian subcontinent and Himalayan Mountains. 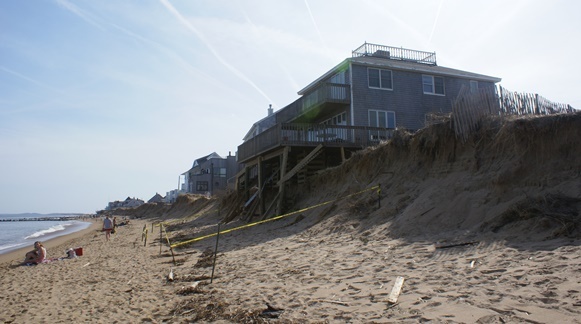 The second, “Sediment Supply in a Regime of Accelerated Coastal Erosion: Paleo-Perspectives, Anthropogenic Influences and Future Challenges” was awarded through NSF’s new Science, Engineering, and Education for Sustainability program, which is designed to provide science-based guidance for better decisions regarding the nation’s environment. Looking to the future, Hein sees the need for increasingly detailed studies and understanding of climate change and its impacts on coastal ecosystems.